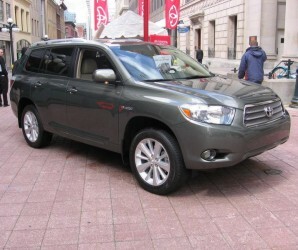 The 2009 Highlander is as sophisticated as it is versatile, designed to match your lifestyle. With its generous cargo space, 60/40 reclining, split, fold-flat second-row seat with slide-forward capability and available third-row seat with 4-step recline fold-flat-into-floor capability, this SUV will go wherever your favorite activities take you. Its standard driver and front passenger front seat-mounted side airbags , and side curtain airbags for the front and second row , along with Toyota's Star Safety System™ and available Leather Seat Package, make the 2008 Highlander a sophisticated travel companion. With a standard, powerful 4-cylinder engine and available V6, the Highlander rides so smooth you'll be reluctant to call it an SUV. There's even a Highlander available with Hybrid Synergy Drive®. Buy a Highlander Hybrid and you may be eligible for federal tax benefits. Plus, multiple states now allow single-occupant use of the carpool lane in your Highlander Hybrid. The Highlander gets 31mpg/city and 27/mpg highway.